MpscAcademy.com does not store any file on its server. MpscAcademy.com is Owned by Softlink Labs. MpscAcademy.com has the Right to Use Your Email Address for Our Promotions. But Don’t worry, We Do not SPAM or Sell Email Address. On MpscAcademy.com you may find Download Links. These Files are stored Archive.org and Some other Respective Websites. All Files are NOT the part of MpscAcademy.com. MpscAcademy.com does NOT carry any responsibility from Them. We only add Links from Other Sites over the Web. Materials Provided To MpscAcademy.com Posted On SitesMpscAcademy.com does not claim ownership of the materials you provide to MpscAcademy.com (including registration data, feedback and suggestions) or post, upload, input or submit to any of the Sites or its associated services (collectively "Submissions"). However, by posting, uploading, inputting, providing or submitting your Submission you are granting permission to MpscAcademy.com to use your Submission in connection with the operation of their businesses including, without limitation, the rights to: copy, distribute, transmit, publicly display, publicly perform, reproduce, edit, translate and reformat your Submission; and to publish your name in connection with your Submission. MpscAcademy.com agrees that it shall not use or sell user identifiable data contained in the Submissions. However, MpscAcademy.com has the sole and exclusive right to use, transfer or otherwise deal with compiled user aggregated data in any manner that MpscAcademy.com deems fit. MpscAcademy.com is a MPSC educational material provider website. So some of material is in MARATHI language, But we clear here that the default and main language of MpscAcademy.com is ENGLISH. We prefer here only English language content first. MpscAcademy.com has NO control over that content and has NO responsibility for such content. 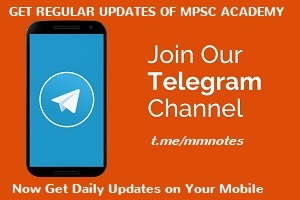 Rather, MpscAcademy.com is merely providing access to such content as a SERVICE to you. We expects all who use the Internet to abide by all laws, including all COPYRIGHT and other intellectual property laws. We believes that persons who make information available on the World Wide Web do so with the expectation that such information will be publicly and widely available. If your copyrighted material has been posted on this website (MpscAcademy.com) or if hyperlinks to your copyrighted material are returned through our search engine and you want this material removed, you must Send the infringement notice via email to admin@mpscacademy.com With Link to The Article. Please allow up to 2 Days for an email response. We process your Request and Remove it if your Request was genuine. The contents of this statement may be altered at any time, at our discretion. Last Updated on 26 September 2016. MpscAcademy.com does not reserve any rights to, nor claims copyright to, any software names listed on these pages. All references are copyright to their respective owners. We only index and link to content provided by other websites. You can try these information at your own responsibility. All Data Displayed here is Gathered From Various Websites, Books and News Papers. We Are Very Thankful to Following Websites.